Flight Steward Sanjid Singh Sandhu, 41. His wife Tan Bee Jeok, 43 was also a MAS flight attendant and the couple have a 10 year old son. Tan was meant to be operating on MH370, but her life was spared when she switched her shift with a colleague. Sanjid himself was not meant to be working flight 17, but in a tragic twist of fate, swapped with another steward. 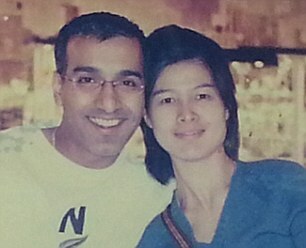 Heres a picture of MH17 flight steward Sanjid Singh Sandhu, 41, his air stewardess wife Tan Bee Jeok, 43. They have a 10-year-old son Hans . Tan was supposed to have been on the ill-fated MH370 which went missing on March 8 and on MH17 as well. But her life wasspared when she switched her shift with a colleague. Sanjid was supposed to have been off but instead swapped his shift with another steward.